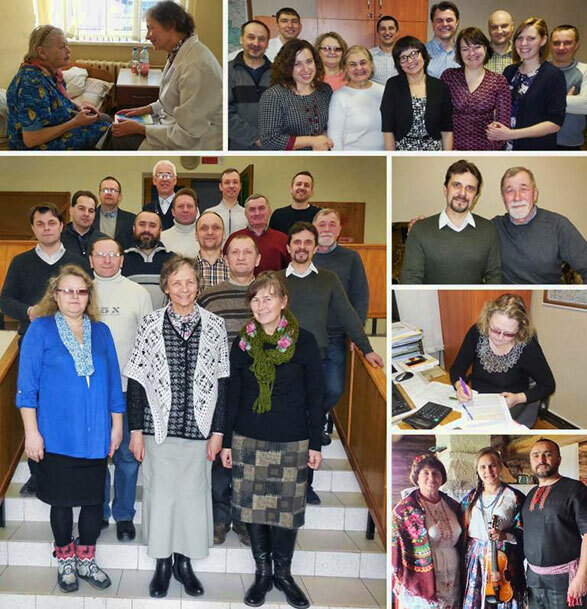 A meeting with all the Slavic Missionary Service workers in Belarus was conducted in February 2018 at the office in Minsk for the SMS Interim Director. A stirring message about Baruch, the personal scribe of Jeremiah the prophet was shared. Baruch was a silent partner that transcribed all the words of Jeremiah, which were given to the prophet by God. At times, Baruch had to present these words at the Temple when Jeremiah was detained in prison. Baruch understood the severity of these words and became discouraged by the attitudes and actions of the Jewish people. God would specifically share a personal message directly to Baruch. First of all, Baruch said that he could find “no rest,” but God said that He would give him rest (Jeremiah 45:3). Secondly, Baruch was “seeking great things” upon this earth (Jeremiah 45:5). God wanted Baruch to listen to His pronouncements and to seek Him. Finally, God said that He would bless Baruch “in all places” wherever he may go (Jeremiah 45:5). These uplifting words were given to Baruch, just as they are given to every believer who desires to follow God’s words and God’s ways. Jesus called all His children to “come to Me, all who are weary and heavy-laden and I will give you rest. Take My yoke upon you, and learn of Me, for I am gentle and humble in heart; and you shall find rest for your souls” (Matthew 11:28-29). Jesus also told His followers not to worry about the necessities of life nor seek the things that the world seeks, “but seek first the kingdom of God and His righteousness; and all these things shall be added to you” (Matthew 6:33). Before Jesus ascended to heaven after His resurrection, He said to His disciples, “Lo, I am with you always, even to the end of the age” (Matthew 28:20). Like Baruch, like Moses, like Joshua and like many others in the Old Testament, Jesus will bless His children wherever they may go, as they trust implicitly in Him. After the message, a powerful time of prayer followed with many of the workers “pouring out” their hearts for God to work through the missionaries and ministries of SMS, even in America. During the gathering and during the week, it was truly inspirational for the interim director to see some of the SMS missionaries “in action.” Slavic Rodnev has now partnered with Alexander Levkovski in Gomel to lead the Bethany Church forward. The camaraderie between the two men reminded everyone of the relationship between Paul and Timothy. Nikolay Semenkovich shared with the Interim Director the wonderful testimony of the “Peter Denyeka” Museum. Sergey Drozd and Boris Volshanok were teaching courses for the “Coram Deo” program. Forty students attended this week of courses. A visit with Yevgenia Chegir to one of the hospitals in Minsk was indeed informational and instructional, showing the urgent need that more workers are needed for the hospital visitation ministry. Olga Jarichevskaya, the SMS bookkeeper and secretary in Minsk also assists many other ministries in Belarus with advice concerning changes in laws and procedure. Truly, the SMS missionaries are using their God-given talents and gifts to honor and glorify the Lord. Thank you for your continual commitment to support these national workers.